Character selection is serious business. Photo courtesy of Matt McElroy. Sunday I got back home from Midwinter Gaming Convention https://www.facebook.com/midwintergamingconvention/ which has become an annual, can’t miss event for me. 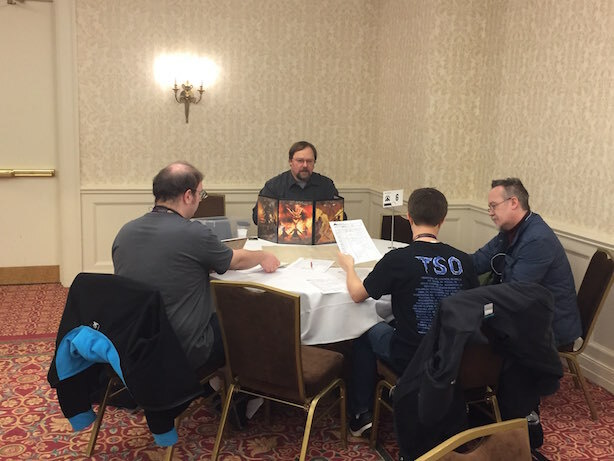 In the past, I’ve gone as booth monkey for Onyx Path, but this year they didn’t need my help at the show, so I volunteered to run three sessions of my convention one-shot, set in the Scarred Lands and using D&D 5E rules. I had 20 of 21 slots filled going into the weekend, so I was really pleased with the turnout. Despite a 45% no-show rate, I still had 11 players (the 12th showed up late due to a previous game running long) for three sessions. They all seemed pleased with the scenario and the game, even though I fumbled my way through a rule or two on occasion. A couple players were genuinely creeped out by the monster when it finally appeared, which means as Dungeon Master, I did my job passably well. The scenario is a simple one; it’s something I had to come up with on the fly at last year’s GameHole Con in Madison, and it worked so well I’ve cleaned it up, and hope to have it ready to post for sale on the Scarred Lands Community Content site (https://www.drivethrurpg.com/browse/pub/4261/Onyx-Path-Publishing/subcategory/8329_29809/Slarecian-Vault&affiliate_id=234579) very soon. That’s an important lesson, and one I forget too easily: Simple is Good. One thing Midwinter has struggled with in recent years is its growth. It’s trying to be a convention for everyone, and yet the boardgame presence is weak at best. Part of this is due to local gamer politics, which I won’t go into any further. Midwinter needs to commit to drawing in the board game community and make stronger overtures to boardgame companies to encourage them to vend at the show – steps that will help create a bigger draw for those gamers. The boardgaming space this year was of acceptable size, but was well removed from the rest of the convention, creating an artificial divide that didn’t encourage the board game crowd to check out any other parts of the show. Another thing they should consider: making it easy to find staff after the registration booth closes for the day. At the very least, someone should be on call and readily accessible in case of an emergency, and signs should be posted around the convention to let people know where that location is. As it was, if I didn’t personally know some of the staff and could find people if I needed to, I wouldn’t have had the first idea where to turn in case of trouble. I sincerely hope no one at Midwinter needed help over the weekend but couldn’t find it. Midwinter’s strengths are LARPs (Live Action Role-Playing) and tabletop role-playing games, and there were plenty of both to be found. There was some variety to be had, and a number of indie RPG publishers continue to attend Midwinter, both to run their games to help spread worth-of-mouth advertising, and also to make their games available for sale, to (hopefully) offset the cost of attending the convention. Midwinter started out life years ago as a LARP event, and has grown ever since. I was stunned to discover that next year will be the 20th anniversary of Midwinter’s first event. I’ve had a good time at the Midwinters I’ve attended: despite some growing pains, it’s a well-run convention and a lot of fun. I hope I’m able to attend next year as well.